Detach the protection cover to access the priming pump. - After filling (5 litres minimum), operate the manual priming pump until some resistance is felt. - Operate the starter motor while depressing the accelerator pedal slightly until the engine starts. If the engine fails to start at the first attempt, wait 15 seconds before trying again. If the engine fails to start after several attempts, repeat the procedure from the beginning. When the engine is idling, accelerate slightly to complete the bleeding of the circuit. 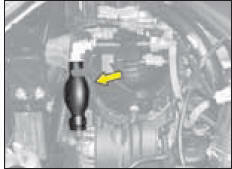 HDi engines are of a highly technical nature. All maintenance and repairs require specific qualifications which only your CITROËN Dealer can guarantee.